How about displaying different Set of un-related Values in a List Box; Values in different column layouts interchangeably? Perhaps, the change over can be with the click of a Button or based on some other action from the User. When we create a List Box or Combo Box we are provided with three different options in MS-Access:Table/Query, Value List or Field List to choose from in the Row Source Type Property to fill with values in them. We normally use one of these Options to create a Combo Box or List Box and insert other Property Values, like Column Count, Column Widths, Bound Column etc. manually. But, we can use a User Defined Function in the Row Source Type Property besides the values mentioned above to fill with Values in a List Box or Combo Box. Even though this Function is known as a User Defined Function it is actually defined by Microsoft Access and given in the Help Documents with specific rules as how to use it with various parameter Values and VBA Code structure. All we have to do is to Copy this Code and Customize to our specific needs. You can get the details of this Function, by placing the insertion point in the Row Source Type Property of a List Box or Combo Box Control and by pressing F1 Key to display the Help Document. When the Help Document is open look for the Hyperlink with the description User-define Function and click on it to display the details of various parameters and what they do in the Function. We will look closely at the second example Code given in the Help Document. The VBA Code is given below and we will use it in a List Box to get a general idea of its usage.
' -1 forces use of default width. Case acLBGetValue   ' Get data. Copy the above Code into a new Standard Module in your Database and save it. Open a new Form in Design View and create a List Box on it. Click on the List Box to select it, if it is not already in selected state. Insert the Function name ListMDBs in the Row Source Type Property overwriting the value Table/Query. The dbs(Entries) = Dir in the subsequent calls uses the first call parameter value "C:\My Documents\*.xls" by default and populates the String Array dbs() in the Initialize step of the Program. This is one of the segments of the Code we can customize and use it for different requirements. After the initializing phase the Function is called repeatedly to obtain other values likes Rows Count, Column Count and others to define the Property Values of the List Box, which we normally set manually on the List Box in design time. The ColumnWidths, when set with the Value -1 in the Program gives the signal to use the Default Values set manually on the Property Sheet without change. This is useful when we need a mixed format of different column sizes when more than one column of information is displayed. Case acLBGetValue ' Get data. Case acLBGetRowCount ' Get number of rows. The System Timer generates new values at every millisecond interval and this ensures that a unique number will always assign to this parameter as a unique Identification Value if more than one User Defined Function is active at the same time. The Code parameter passes appropriate values used in the Select Case statements and uses the Returned Values to define the List Box Property Values. If you understood or have a general idea as how this function works to define the contents of a List Box or Combo Box then we can go forward with the trick that I have mentioned at the beginning of this Article. 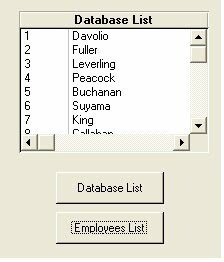 We will create a Copy of the above Code and modify to create a List Box with Employees Code and First Name Values (two Columns of Values) from the Employees Table of Northwind.mdb database. Import the Employees Table from C:\Program Files\Microsoft Office\Office11\Samples\Northwind.mdb. Case acLBGetColumnWidth    ' Column width. Case acLBGetValue                ' Get data. Open the Form in Design View with the List Box that we have created earlier. Click on the List Box to select it. Display the Property Sheet (View- ->Properties). Change the Column Widths Property Value to 0.5";1.5". Case acLBGetColumnWidth ' Column width. If the value in the Column Widths Property is a single value (say 1") then a multi-column List will use 1 Inch for all Columns. This may not give a nice look for values with different length. You may try this with different values to understand them better. Create a Command Button on the Form. Ensure that the Command Button is in selected state and display the Property Sheet. Click on the On Click Property and select [EventProcedure] from the Drop Down control and Click on the Build (. . .) Button to open the VBA Module with the skeleton of the On Click Event Procedure. Copy and Paste the following lines of Code in the middle of the Event Procedure. Change the name of the List Box (the name in Bold Letters) to match with the name of your own List Box. Create another Command Button below the first one. Repeat the Procedure in Step-10 and 11 for the On Click Property of the second Command Button. Change the name of the List Box (the name in Bold Letters) in the Code to match with the name of your own List Box. 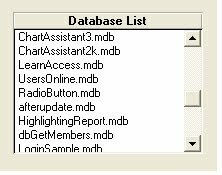 Since, you have already inserted the ListMDBs User Defined Function in Row Source Type Property earlier the list of databases will appear in the List Box first. Click on the second Command Button to change the List Box contents to the Employees List. Click on the first Command Button to change the List Box Contents back to the Database List again. It works for Combo Boxes in the same way. You may create a Combo Box control and try in the same value. 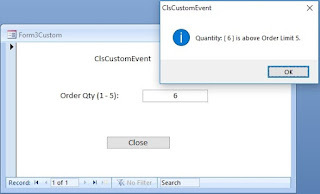 Don't forget to set the Default Value Property with the value 1, otherwise the Combo Box may not show anything in its Text Box area before you select an item from the List.